Purpose: The purpose of this study was to evaluate the effectiveness of niacin (B3) on glycosylated hemoglobin (HbA1c), alone and as adjunct therapy, with chromium picolinate (CrPlt) and sitagliptin. In the present study, we have evaluated the effects of niacin and chromium picolinate supplementation with sitagliptin in Type 2 diabetes mellitus (T2DM) patients. Methods: A randomized controlled trial was conducted on 600 patients suffering from T2DM from four different hospitals in Lahore, Punjab, Pakistan; patients were divided into three groups (n=200 per group). Group A was given sitagliptin (100 mg), Group B received niacin (14 mg/d) along with sitagliptin, and Group C received chromium picolinate (200 mcg/d) and niacin (14 mg/d) along with sitagliptin, for a duration of 6 months. Analysis of variance (ANOVA) was used to compare the efficacy of all treatment groups, and statistical significance was set at p≤0.05. Results: The data indicated that all defined therapies have a significant influence with respect to fasting blood sugar (FBS) (p<0.0001), random blood sugar (RBS) (p<0.0001) and glycosylated hemoglobin (p<0.0001). Conclusion: Our study demonstrated that low doses of niacin and chromium picolinate supplementation with sitagliptin helps in maintaining glycemic control in patients with T2DM, and provides the best treatment option among those considered. Type 2 diabetes mellitus (T2DM), previously known as non-insulin-dependent diabetes mellitus, is the most common non-transmissible disease in the world characterized by insulin resistance leading to hyperglycemia 1. T2DM affects more than 150 million people globally and is responsible for the most number of deaths in the world 2. The incidence of T2DM is increasing exponentially. In fact, more than 366 million people worldwide are expected to suffer from T2DM in 2030 3. There are many complications associated with T2DM, even though treatment can prevent some of the devastating complications. However, in general, treatment does not completely restore normal blood glucose levels nor reverse complications once developed 4. Hyperglycemic symptoms include polydipsia, polyuria, obesity, hypotension, nighttime enuresis, and blurred vision. Slow growth and susceptibility to various infections may also be associated with hyperglycemia 5. Most of the complications with T2DM develop before the diagnosis of the disease 6. Many times, the method of treating diabetes remain insufficient and the only prevention is recommended by exercise and diet 78. There is increasing evidence that beta cell dysfunction is critical to the development and progression of T2DM and a major determinant of impaired glucose tolerance. Subsequently, T2DM is associated with reduced insulin sensitivity and beta-cell function 9. T2DM can be confirmed by various laboratory tests as follows: blood glucose tests including fasting blood glucose testing (FBG), random blood glucose testing (RBG), and oral glucose tolerance test (OGTT); and urine tests including ketonuria 10. Different types of management have been used to control glucose levels in T2DM patients, including lifestyle modification, diet, and exercise. Pharmacological management includes the major classes of oral anti-diabetic medications, which include biguanides, sulfonylureas, meglitinide, thiazolidinedione (TZD), inhibitors of dipeptidyl peptidase-4 (DPP-4), and inhibitors of sodium-glucose cotransporter-2 (SGLT2) 11. Pharmacological therapies are crucial in the treatment of T2DM. The inhibition of DPP-4 increases glucagon-like peptide-1 concentrations that inhibit glucagon release, which then lead to stimulation of insulin release, detainment of gastric emptying, and reduction of appetite. Sitagliptin was the first DPP-4 inhibitor-based treatment to be marketed in the United States in 2007. Sitagliptin is a highly effective and specific DPP-4 inhibitor that produces rapid and long-term inhibition of DPP-4 and significantly reduces plasma glucose levels in patients with T2DM 12. Hyperglycemia in T2DM was indicated by FBG >126 mg/dl or HbA1c >7.9% (Group, 2008). T2DM is a multi-factorial disease that is typically linked to glucose metabolism, particularly carbohydrate and fat management in humans. Moreover, most micronutrients are involved in some way, either as part of the cause or effect of this chronic pathology. The consequences and complications of diabetes are the results of an imbalance between free radical formation and their control by natural antioxidants. Thiamine, riboflavin, niacin, pantothenic acid, pyridoxine, biotin, cobalamin and folic acid are usually grouped as B vitamins, and although most of them have been linked to T2DM, there is not much information on riboflavin or pantothenic acid 13. The vitamin, niacin, acts as salutary among people with T2DM who have cardiovascular issues. Additionally, it helps in uplifting the load of oxidation due to metabolic disorders and reducing diabetic complications. Niacin can be used in doses of 1.5–3 g daily to lower cholesterol and triglycerides by inhibiting synthesis of LDL, while raising high-density lipoprotein cholesterol. It is often used in combination with a statin 14. Chromium is a vital mineral necessary for normal glucose and lipid metabolism. Chromium III is considered to be a biologically active form of chromium, and was discovered in brewer's yeast. The most commonly used formulations of trivalent chromium are chromium picolinate (CrPlt), chromium nicotinate, and chromium chloride 15. Chromium picolinate formulation was designed to improve absorption in digestion. Deficiency of chromium in the body may lead to reversible insulin resistance and diabetes. However, the effect of adding chromium to individuals who are not heavily chronically deficient is still unclear. Pharmaceutical companies have broadly promoted the benefits of chromium for insulin resistance treatment and T2DM prevention. Moreover, the benefits of chromium have been linked to other conditions, such as cardiovascular diseases and hyper-lipidemias. Thus, it has garnered much public attention. Chromium is one of the trace elements whose mechanisms at the cellular level are still unclear, such as how chromium supports the normal metabolism of glucose and lipids. Chromium picolinate has a better absorption curve and is more effective than other elements. It also increases phosphorylation and binding of insulin at the receptor site, thereby reducing insulin resistance 16. The objective of the current study was to evaluate the effects of low doses of niacin and chromium picolinate supplementation with sitagliptin in T2DM patients. The study was conducted on 600 patients (n=600) suffering from T2DM and who fulfilled the study’s inclusion criteria. Patients were divided into three groups, with each comprised of 200 patients. In this study, the T2DM patients ranged in age from 30-60 years. The subjects had never participated in any diabetes support or training programs during the last 6 months. During the last 2 months, the patient did not take vitamins or minerals. Moreover, the subjects included in the study had glycosylated hemoglobin (HbAlc) >8% and hemoglobin (Hb) >12-14, and did not have kidney disease. Subjects with hypervitaminosis were excluded from the study, as were those who developed cancer (of any type) or cardiovascular disease during the research study. Among the excluded were also subjects who were disabled, those with potential psychiatric or gastrointestinal problems, those who were pregnant or breastfeeding, those taking more than 50-75 mg nicotine each day, and those using alcohol each day. Moreover, subjects taking various drugs (e.g. antibiotics, tetracycline, aspirin, anti-seizure medications, anticoagulants, alpha-blockers, cholesterol-lowering drugs, and isoniazid) were also excluded. The study protocol and consent form were approved by the Hajvery University Ethical Committee of Lahore, Pakistan (ethical no. Hu14772-03-2017), in accordance with the Declaration of Helsinki. Written informed consents were obtained for each study participant prior to the study. The study herein was a randomized controlled trial involving outdoor diabetic clinics from four different hospitals in Lahore, Punjab, Pakistan (Jinnah Hospital, Diabetic Institute of Pakistan, Sheikh Zayed Hospital, and Akhuvat Foundation) Figure 1. The subjects were randomized into three arms using block randomization, and consented in writing. A block size of 10 was randomly determined to avoid selection bias. For each center, 3 blocks were used to generate the random numbers; the randomization was central. The study was designed to investigate the effects of sitagliptin (100 mg/day), along with chromium picolonate (200 mcg/day) and niacin (14 mg/day) supplementation, for six months. The effects of this regimen on FBS, RBS, and HbA1c levels were evaluated. Patients (n=600) suffering from T2DM, who fulfilled the inclusion criteria, were divided into three groups, each consisting of 200 patients. Group A was given sitagliptin (100 mg OD), Group B received niacin (14 mg) daily along with sitagliptin (100 mg OD), and Group C received chromium picolinate (200 mcg), niacin (14mg OD) and sitagliptin (100 OD) for up to 6 months. After completing the initial 3-month period, biochemical tests (such as for glycosylated hemoglobin), and the means of the FBS and RBS of the past three months, were evaluated. Samples of the patients’ blood were collected before starting the treatment (day 0 sample), after 3 months of treatment, and then after 6 months of treatment. Analysis of the blood at those time points allowed for monitoring changes in different parameters during the study. FBS and RBS were measured on a daily basis (FBS once and RBS thrice a day). Glycosylated hemoglobin was measured by ion exchange chromatography by using a commercial kit (Sigma-Aldrich, St Louis, MO, USA). All participants' blood samples were collected at the start, three months later, and at the end of treatment. Blood samples were taken after participants take drugs 10-14 hrs. Random blood sugar was measured after 2 hours of post meal intake. Overnight-fasted 5 ml of blood vein samples were collected into sterile tubes containing EDTA. The biochemical markers of blood glucose balance were FBS, RBS, and HbA1c 17. All data were analyzed by Graph Pad Prism version 7.0 software. One way ANOVA was applied using Tukey range test. The value of p<0.05 was considered significant. Figure 1 . 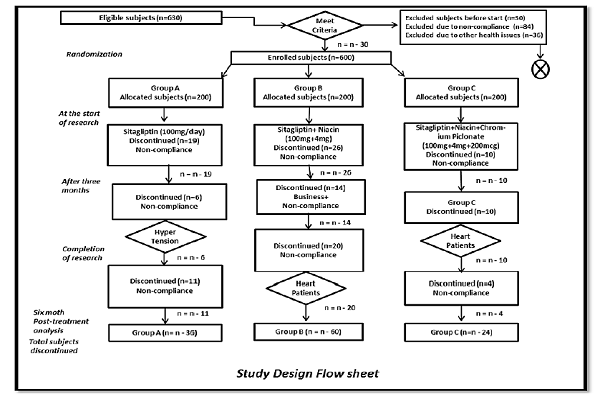 Study design Flow Sheet . The study was conducted on 600 patients (n=600) suffering from T2DM. Patients were divided into three groups, with each comprised of 200 patients. Patients ranged in age from 30-60 years. The subjects had never participated in any diabetes support or training programs during the last 6 months. The biochemical markers of blood glucose balance were Fasting blood sugar (FBS), Random blood sugar (RBS) and glycosylated hemoglobin The subjects included in the study had glycosylated hemoglobin (HbAlc) >8% and hemoglobin (Hb) >12-14, and did not have kidney disease. The study was designed to investigate the effects of sitagliptin (100 mg/day), along with chromium picolonate (200mcg/day) and niacin (14 mg/day) supplementation, for six months. Group A was given sitagliptin (100 mg OD), Group B received niacin (14 mg) daily along with sitagliptin (100 mg OD), and Group C received chromium picolinate (200 mcg), niacin (14mg OD) and sitagliptin (100 mg OD) for period for up to 24 weeks. T2DM subjects (n=630) were screened for eligibility, 30 did not meet the eligibility criteria. Therefore, 600 subjects were included in the study. The subjects ranged in age from 31-60 years; both male and female subjects were initially equal in number. At the start of the study, 45 subjects refused to participate, and after 12 weeks, 30 more subjects left the study due to non-compliance or disease. By the end of the 5th month of the research study, 35 more subjects exited the study due to business or non-compliance. Therefore, the total numbers of excluded subjects were 120, rendering to non-compliance (n=84) and health issues (n=36). Figure 2 . Graphical representations of FBS mean values. Representing the fasting blood glucose levels of group A (Sitagliptin), group B (Sitagliptin/Niacin) and group C (Sitagliptin/Niacin/Chromium piclonate); representing the significant improvement from mean baseline values of FBS, after receiving (sitagliptin/niacin/chromiumpiclonate) therapy for six months as compared to (Sitagliptin/Niacin) and (Sitagliptin alone). The effect of theB 3 and CrPlt combine therapy shown better result on FBS as compared to sitagliptin alone vs 12 weeks,***(p<0.0005), baseline vs 6 months of therapy**** (p<0.0001) while comparison between 3 vs 6 months therapy shows significance***(p<0.0005). Figure 3 . Graphical representations of RBS mean values . Representing the random blood glucose (RBS) levels of group A (Sitagliptin), group B (Sitagliptin/Niacin) and group C (Sitagliptin/Niacin/Chromium piclonate). There is a decrease in (RBS) mean comparing the six months therapy, baseline results shows higher value in RBS as compared to the 12 weeks and 6 moths therapy. The effect of the B 3 and CrPlt combine therapy shown better result on (RBS) as compared to sitagliptin alone. Baseline vs 3 months, **** (p<0.0001), baseline vs 6 months of therapy **** (p<0.0001) while comparison between 3 vs 6 months of therapy shows less significance **(p<0.0067). Figure 4 . Graphical representations of Glycosylated hemoglobin mean value . Representing the glycosylated hemoglobin (HbA1c) levels of group A (Sitagliptin), group B (Sitagliptin/Niacin) and group C (Sitagliptin/Niacin/Chromium piclonate). There was substential decrease in Glycosylated hemoglobin mean values after 3 and 24 weeks of therapy as compared to baseline mean values. The effect of the B 3 and CrPlt combine therapy with sitagliptin show effectiveness as compared to sitagliptin alone and Niacinalone. Baseline vs 12 weeks, ****(p<0.0001), baseline vs 24 weeks of therapy **** (p<0.0001) while comparison between 3 vs 6 **(p<0.0001). According to our analysis, an informative window for FBS, RBS and glycosylated hemoglobin monitoring in T2DM patients with unstable glycemic control occurs after approximately 6 months of therapy Figure 2Figure 3Figure 4. FBS of the subjects at the start of the study shows uncontrolled and unstable glucose levels; indeed, FBS>270 and FBS<150 were the maximum and minimum baseline levels. However, after the first phase of therapy, which lasts up to 3 months, the results regarding the mean FBS values are compatible compared to baseline measurements. The baseline comparison between group A and group B was not significant # (p=0.1356), while the comparison between group B and group C showed the same results #(p= 0.2275). Comparison of groups A and group C show a statistically significant difference from baseline levels **(p=0.0014). The results of FBS comparison after 12 weeks of therapy showed some improvement after treatment. Comparison of FBS for group A versus group B demonstrated they were not statistically different #(p= 0.4665). However, comparison of group A versus group C was ***(p= 0.0009), and between group B and group C was *(p= 0.0345). After the 6-month therapy, FBS was significantly different between Group A and B, ***(p<0.0001); between Group A and C, ****(p<0.0001), while FBS comparison between Group B and C were insignificant, #(p= 0.6992). At the beginning of the study, the baseline RBS levels showed the highest values. Comparison between all 3 groups was done by evaluating baseline uncontrolled RBS levels and those after treatment. The comparison between Groups A and B shows #(p= 0.9997), while the comparison between the RBS levels of Group A and C, and of Group B and C, show similar and insignificant baseline results; #(p= 0.9974) and #(p= 0.9989), respectively. The highest and lowest RBS values recorded were RBS>321 and RBS<191. After 3 months of therapy, the RBS comparison between the groups was done. The comparison between Group A and B, and Group A and C, were #(p= 0.9123) and #(p= 0.2649), respectively. Comparison of Group B and C were also insignificant; #(p= 0.4820), which was also non-significant. At the end of the 6-month therapy, the mean RBS results were again evaluated. The comparison between Group A and B, and Group A and C, were #(p= 0.9120) and ****(p= 0.0001). Thus, there was an insignificant comparison between Group A and B; on the other hand, comparison of Group A and C yielded significant results and differences between the mean RBS values. The comparative results of therapy between group B and C was found to be significant; ****(p= 0.0001). These results showed the promise of sitagliptin/niacin/chromium picolinate therapy. After the recruitment of the eligible subjects for the study, the baseline glycosylated hemoglobin levels were recorded. The highest and the lowest value of glycosylated hemoglobin levels recorded were HbA1c<11.5 and HbA1c>7.2. Comparisons between glycosylated hemoglobin between the 3 treated groups were: Group A vs. B, #(p= 0.7984; non-significant); Group A and C), #(p= 0.1876; non-significant). However, the comparison between group B and C showed little significance, *(p= 0.0447). The median results showed the drug intervention decreases the glycosylated hemoglobin levels. The analysis between sitagliptin, sitagliptin/B3, and sitagliptin/B3/ CrPlt treated group were Groups A and B), #(p= 0.8043); while the comparison between Group A and C, and group B and C; the values were shown to be ***(p= 0.0001) and **(p= 0.0011), respectively. Furthermore, analysis of the results indicated that the highest and lowest value of glycosylated hemoglobin was observed to be (HbA1c<8.2) and (HbA1c>7.1), respectively. The comparative results between the 3 groups were: Group A and B, ****(p= 0.0001); Group A and)****(p= 0.0001) showed highly significant results as compared to the comparison between (Group B and C), *(p= 0.0128). Thus, there was no statistical significance for these groups. We recognized that medication changes would need to be assessed on a case-by-case basis and would depend on individual patients, and their FBS, RBS, glycosylated hemoglobin levels, and combination of medications the patient is taking. Our study concludes that low doses of niacin, and chromium picolinate supplementation with sitagliptin, can improve glycemic control in patients with T2DM, and is possibly the best treatment option in the management of T2DM. However, when and where niacin supplementation would be used in diabetic treatment, it should be noted that the doses be monitored according to the health status of the patient (as hyperglycemia may occur), and only given at a low dose. Excessively frequent tests may lead to unnecessary regimen changes, which may contribute to adverse effects; these tests include hypoglycemia, a greater treatment burden, and higher healthcare costs. The study protocol and consent form were approved by the Hajvery University ethical committee (Lahore-Pakistan). Ethical no (HU14772-03-2017) and conducted in accordance with the Declaration of Helsinki. Written informed consent was obtained, for their participation. No funding was used in this study. Fauzia Karim, Aisha Hussain, Hina Khalid, Muhammad Bilal Tufail & Zeeshan Akbar collect the Patients data from Different Hospitals. Komal Najam, Ali Sharif and Lubna Shakir analyzed the collected data. Sana Ajmal and Anum Anwar re-analyzed and write the paper while Awais Ali Zaidi act as corresponding author. We acknowledge higher education commission (HEC) of Pakistan for promoting and establishing strong opportunities for research. We are also thankful to our learned faculty members for their active guidance throughout this research study. Mathers C. D., Loncar D.. Projections of global mortality and burden of disease from 2002 to 2030. PLoS Medicine. 2006; 3 : e442 . Bucher S., Panjo H., Al-Salameh A., Bauduceau B., Benattar-Zibi L., Bertin P., representing the S. Ages investigators. Relationship between achieved personalized glycaemic targets and monitoring of clinical events in elderly diabetic patients. Diabetes & Metabolism. 2017; 43 : 59-68 . Wild S. H., Roglic G., Green A., Sicree R., King H.. Global prevalence of diabetes: estimates for the year 2000 and projections for 2030: response to Rathman and Giani. Diabetes Care. 2004; 27 : 2569-2569 . Maggi Davide, Bordone Caterina, Briatore Lucia, Cheli Valeria, Fontana Luigi, Mazzucchelli Chiara, Montecucco Fabrizio, Adami Gianfranco, Cordera Renzo. Glucose-targeted therapy for subjects with type 2 diabetes mellitus: primum non nocere. European journal of clinical investigation. 2017; 47 (10) : 691-693 . Association A. D., American Diabetes Association. 2. Classification and diagnosis of diabetes. Diabetes Care. 2017; 40 : S11-24 . Dabelea D., Stafford J. M., Mayer-Davis E. J., D’Agostino R., Dolan L., Imperatore G., Association of Type 1 diabetes vs type 2 diabetes diagnosed during childhood and adolescence with complications during teenage years and young adulthood. Journal of the American Medical Association. 2017; 317 : 825-35 . Barry Eleanor, Roberts Samantha, Oke Jason, Vijayaraghavan Shanti, Normansell Rebecca, Greenhalgh Trisha. Efficacy and effectiveness of screen and treat policies in prevention of type 2 diabetes: systematic review and meta-analysis of screening tests and interventions. bmj. 2017; 356 : i6538 . Eriksson K. F., Lindgärde F.. Prevention of type 2 (non-insulin-dependent) diabetes mellitus by diet and physical exercise. The 6-year Malmö feasibility study. Diabetologia. 1991; 34 : 891-8 . Boden G., Shulman G. I.. Free fatty acids in obesity and type 2 diabetes: defining their role in the development of insulin resistance and β-cell dysfunction. European Journal of Clinical Investigation. 2002; 32 : 14-23 . Association A. D., American Diabetes Association. Screening for type 2 diabetes. Diabetes Care. 2004; 27 : S11-4 . Marguet Didier, Baggio Laurie, Kobayashi Takashi, Bernard Anne-Marie, Pierres Michel, Nielsen Per F, Ribel Ulla, Watanabe Takeshi, Drucker Daniel J, Wagtmann Nicolai. Enhanced insulin secretion and improved glucose tolerance in mice lacking CD26. Proceedings of the National Academy of Sciences. 2000; 97 : 6874-6879 . Drucker D. J., Nauck M. A.. The incretin system: glucagon-like peptide-1 receptor agonists and dipeptidyl peptidase-4 inhibitors in type 2 diabetes. Lancet. 2006; 368 : 1696-705 . Valdés-Ramos Roxana, Ana Laura Guadarrama-Lopez, Beatriz Elina Martinez-Carrillo, Alejandra Donaji Benitez-Arciniega. Vitamins and type 2 diabetes mellitus. Endocrine, Metabolic & Immune Disorders-Drug Targets (Formerly Current Drug Targets-Immune, Endocrine & Metabolic Disorders). 2015; 15 (1) : 54-63 . Sazonov V., Maccubbin D., Sisk C. M., Canner P. L.. Effects of niacin on the incidence of new onset diabetes and cardiovascular events in patients with normoglycaemia and impaired fasting glucose. International Journal of Clinical Practice. 2013; 67 : 297-302 . Anderson R. A., Roussel A. M., Zouari N., Mahjoub S., Matheau J. M., Kerkeni A.. Potential antioxidant effects of zinc and chromium supplementation in people with type 2 diabetes mellitus. Journal of the American College of Nutrition. 2001; 20 : 212-8 . 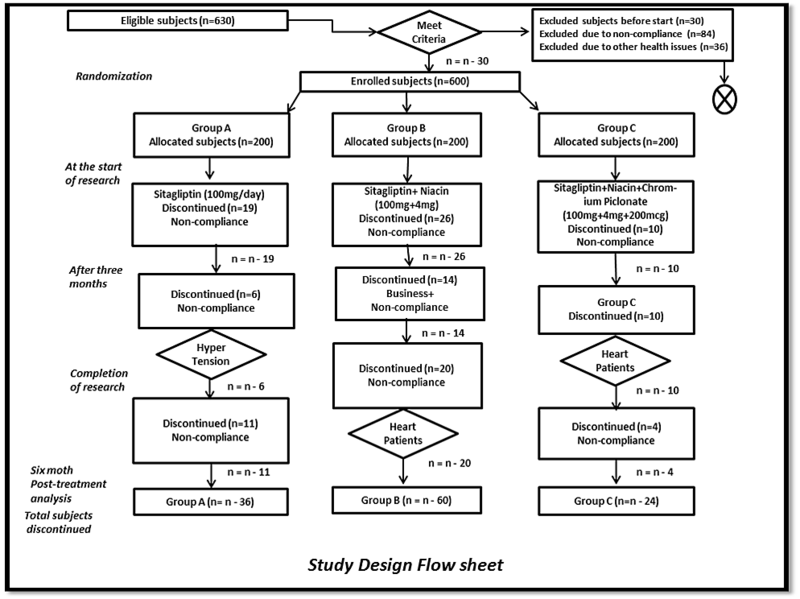 Kleefstra N., Houweling S. T., Bilo H. J.. Effect of chromium supplementation on glucose metabolism and lipids: a systematic review of randomized controlled trials. Diabetes Care. 2007; 30 : e102-102 . El-Ashmony S. M., Morsi H. K., Abdelhafez A. M.. Effect of Zinc Supplementation on Glycemic Control, Lipid Profile, and Renal Functions in Patients with Type II Diabetes: A Single Blinded, Randomized, Placebo-Controlled, Trial. Journal of Biology. 2012; 2 : 33-7 . Fauzia Karim, Komal Najam, Ali Sharif, Lubna Shakir, Sana Ajmal, Anum Anwar, Aisha Hussain, Hina Khalid, Muhammd Bilal Tufail, Awais Ali Zaidi, 2018.